Design and the Migrators - Genesis Alive! The Killer Whale and Pacific Golden Plover, true Alaska residents. Hey Dad, wait for me!!" The young of the Golden Plover are left in Alaska by their parents, who start out on a leisurely 88 hour 2500 mile trip home to Hawaii! Most remarkably; "the young plovers, which are only about two months old arrive [in Hawaii] about two weeks after the adults".1 So how do they "know" their way to the new "snow bird" destination? By instinct. Instincts come into play in many animals and remain unexplained in science. These characteristics point to a Creator who designed such capability into the Animal Kingdom as desired. If accidents were involved none of the young would find their way and perish in the expanses of the Pacific Ocean, and the Plover species would die off in one generation. Blackpoll Warbler - the little bird with a marathon attitude! Blackpoll Warbler migration route, the Atlantic hop is accomplished in 100 hours! This North American avian has figured out an express way of getting to its winter refuge in Venezuela. The bird fattens itself up before taking a ride on a southern trade wind, sailing from the Northeastern U.S. to South America in a hundred hours—entirely over the open ocean. On the way back home against the wind, the bird takes the more Westerly scenic route, stopping to land, rest and refuel. Worlds most sophisticated Sonar/Communications system is in that nose! The Killer whale in action, an intelligent creature for sure! Beauty in form and striking in color - an accident of mutations? In truth, while attacking in low light or in the depths, these markings aid the whales in identification of friend or foe, and the eye patch directs adversaries away from their eyes in a fight. Stunning! So in these beautiful and powerful creatures we have a package of advanced marine-ready sensory systems. The integration and operational capabilities of these animals match our best Submarines, another proof positive of Intelligence acting on Matter with a Plan! 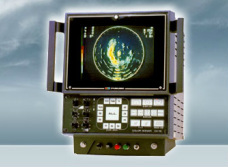 A scanning color sonar display/control unit. This sonar comes in 66, 88 or 150 Khz versions. The author installed a unit like this in Alaska in the 1980's on the F/V Osprey with great success. It is limited compared to the sonar found in toothed whales, as it has no two-way communications nor instantaneous frequency shift or pulse-width capabilities. Whales may simultaneously sonar scan, depth find and communicate with each other. I have webbing between my toes, does that count? Marine Mammal Evolution? Use your Imagination! One evolution story for marine mammals claim some type of bear stayed in the water to long, lost it's fur, it's nostrils migrated to the top of its head (and became a single one) over millions of years of evolutionary magic! Where the dorsal fin came from is left to your imagination. Even Darwin promoted this idea - creative, but no basis in science. Whales also have special eyes that see well on the surface, and specialized eye chemistry slave that secretes at just the right times while swimming. Consider the whales' complex and unique sonar and acoustic systems described here that no land mammal employs. What a testimony to a Super Intelligence trumping man's best devices and confounding evolution theory... unless your imagination has lost touch with reality. - In "The Origin of Species" by Darwin, he states; "In North America the black bear was seen . . . swimming for hours with widely open mouth, thus catching, like a whale, insects in the water.... I can see no difficulty in a race of bears being rendered, by natural selection, more and more aquatic in their structure and habits, with larger and larger mouths, till a creature was produced as monstrous as a whale." We must understand that Darwin's view of genetics was completely wrong. His understanding was that the environment could add information to the genes like you can add information to a computer disk or hard drive. Such information would then show as a trait in the next generation and natural selection would guide it's success or failure. This concept was in his mind when he observed nature and wrote Origin. He also was perplexed in the book about the complexity of the eye. When modern genetic research disproved his theory, followers devised the mutational theory that proposes that mistakes in DNA/Cell operation causes the changes. In practice this idea has been falsified but has gained such popularity its difficult to get people to slow down and really look at the mechanisms and processes involved. Whale evolution video https://vimeo.com/235787390​ Also see The Question of Complexity - Genesis Alive! for more. Hey, I was chasing a moth not a Hornet! New research has uncovered an amazing relationship between Tiger, Hawk Moths and Bats. It's been found that these moths, the bats fav dinner, can actually sense and then jam a bats radar! When the moth senses the radar frequency, it fly's evasively and then vibrates a signal that jams the bats radar and mimmic's an insect detestable to the bats taste! These are referred to as electronic countermeasure's in military lingo! Males and females use different vibration techniques. (1) Many systems in the Biological world are an image of our most advanced technologies!